SINGAPORE (April 4): Asian currencies edged lower on Tuesday as investors turned cautious on riskier assets ahead of a meeting between US President Donald Trump and Chinese President Xi Jinping later in the week. The South Korean won slipped 0.2% against the US dollar, with market participants focusing on what Trump and Xi might say about their strategies on North Korea. The Thai baht fell 0.2%, while the Malaysian ringgit eased 0.1%. Trump is due to host Xi on Thursday and Friday at his Mar-a Lago retreat in Florida. Trump had set the tone for a tense first meeting with Xi by tweeting last Thursday that the United States could no longer tolerate massive trade deficits and job losses. Christopher Wong, senior FX strategist for Maybank, however, said Asian currencies could edge higher ahead of the US-China summit. "We believe the Xi-Trump meeting could reignite tensions on trade and currencies," Wong said. 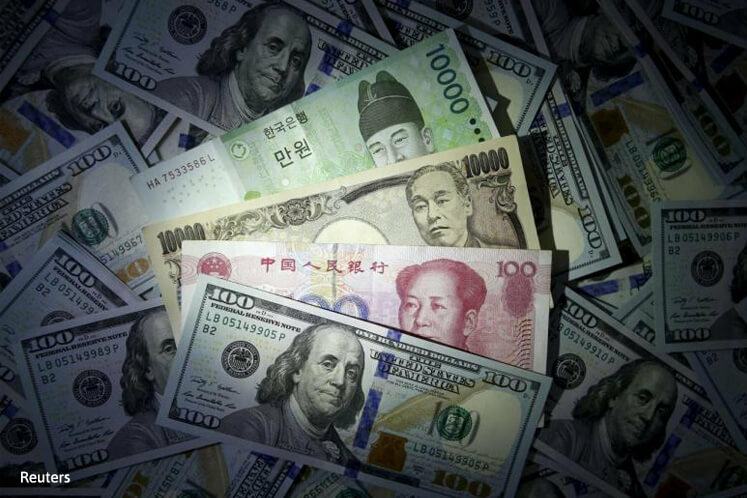 In the lead up to the meeting, the US dollar may face downside pressure against the currencies of trade surplus countries that are seen as facing the risk of being labelled currency manipulators by the United States, Wong said. The greenback could come under pressure against currencies such as the offshore Chinese yuan, South Korean won and Taiwan dollar, he added. Singapore's central bank is expected to keep its monetary policy settings unchanged at its April review expected next week, but some analysts see the risk of tightening later in the year in response to rising inflation and as exports were on the mend, according to a Reuters poll. The Monetary Authority of Singapore (MAS) manages monetary policy by changes to the exchange rate, letting the Singapore dollar's nominal effective exchange rate (NEER) rise or fall within in an undisclosed policy band. One focus among analysts is whether the central bank will make any changes to the forward guidance it introduced in its last policy statement in October, when MAS stood pat and maintained a stance of zero percent appreciation for the Singapore dollar NEER's policy band. The central bank said in October that it "assesses that a neutral policy stance will be needed for an extended period to ensure medium-term price stability." A removal of that guidance could stoke market speculation about the risk of the MAS tightening policy later this year, analysts say. That forward guidance will probably be kept in the April policy statement, said SMBC's Suzuki, adding that the central bank likely wants to see a sustained economic recovery and a pick-up in inflation before removing it. *Markets in India are closed on Tuesday for holiday. *China, Taiwan markets are closed April 3-4 for holiday.